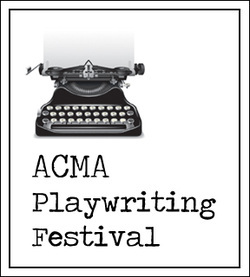 ACMA PLAYWRITING FESTIVAL - ACMA THEATRE CO.
Three years ago a junior and two sophomores brought back the ACMA One Act festival. These were short plays written, directed, and performed by ACMA students. At the time it had been years since the school had had this opportunity. After their growing success over the past three years the ACMA Theatre Company, along with the Playwriting class are putting on not one, but four shows throughout the semester. These shows will give opportunities to middle schoolers and high schoolers and be an exciting way for students to explore all sides of the theatre process. This first show is called the ACMA Zone. Nine short plays based off of the Twilight Zone. These plays will be performed on the Main Stage on November 21, 22, and 23 at 7:00pm. The cast is entirely made up of Theatre 1 students and directed by Seniors and Juniors. December 12, 13, and 14 at 7:00 pm. In December high school students will have the opportunity to perform in ACMA Live. A series of plays written in sketch comedy format, like a holiday episode of Saturday Night Live. The last night of the season will take place on the ACMA main stage, this time for one night only. Writing students will gather props, character ideas, costumes, and genre ideas throughout the school day on the 10th of January before spending the rest of the night writing shows using their collected items. The next morning actors and directors will arrive at ACMA and spend the rest of the day rehearsing their scripts before the show goes up at 7. This one night performance of the 24 Hour Playwriting Festival will be January 11th at 7:00 pm, don't miss it.